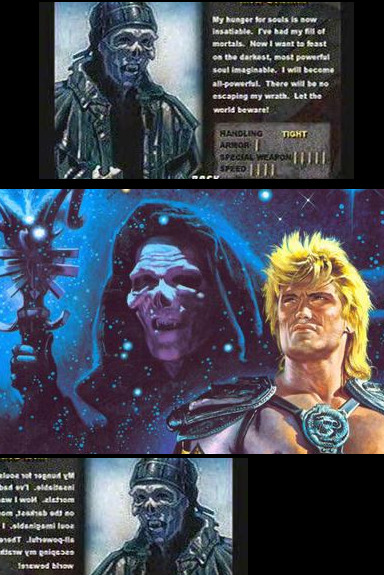 While scrolling through some youtube movies I saw the poster from some old Dolph Lundgren movie, Masters of the Universe (1987). I thought the skull looked familiar and indeed it seems like it looks the same as Mr. Grimm from TM3. My guess is that they traced the image or at least used it as a reference for their drawing in TM3. 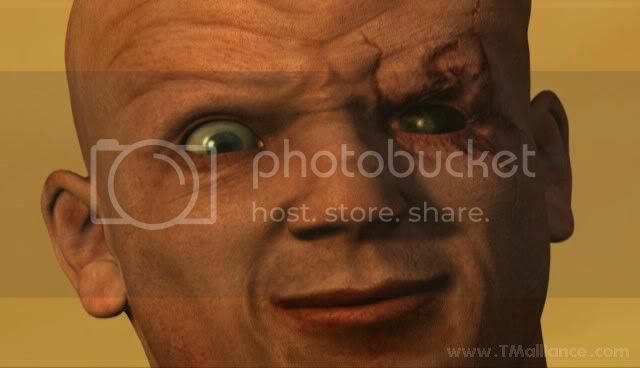 I know tracing images for videogame graphics (and not caring about copyrights) was a common practice back in the 90's, so does anyone know if any other TM graphics are traced from "real" pictures? Maybe Firestarter is traced from a real photo of Keith Flint (RIP ) ? Nice find! Hilarious that a terrible film would inspire part of a terrible video game. It does look a little traced from Skeletor's film image, you're probably right. Mr. Grimm was always kind of an unoriginal character despite being in every TM. Grimm was originally a mix of the grim reaper and Ghost Rider. TMIII gave him more a Skeletor look. TMIV made Grimm a pirate with a parrot, possibly inspired by Captain Hook. TM Black had a Grimm that seemed inspired by movies like Full Metal Jacket (because he's a disturbed Vietnam soldier) and Silence of the Lambs (because he's a cannibal). TM 2012 had a Grimm whose look was inspired by old action movies that featured biker gangs, Jamaican voodoo crime lords, etc. And his stuntman father was inspired by Evel Knievel. Twisted 2’s Grimm is one of my favorite characters in any medium. The look, the background, and that blasted English garbled accent. I wish we could have seen characters like this expanded on in further entries instead of what we got in TM ‘12.